The Mino-niigaanendmowin program is designed to help adults get the basic education and life skills they need in order to begin contributing to their community. 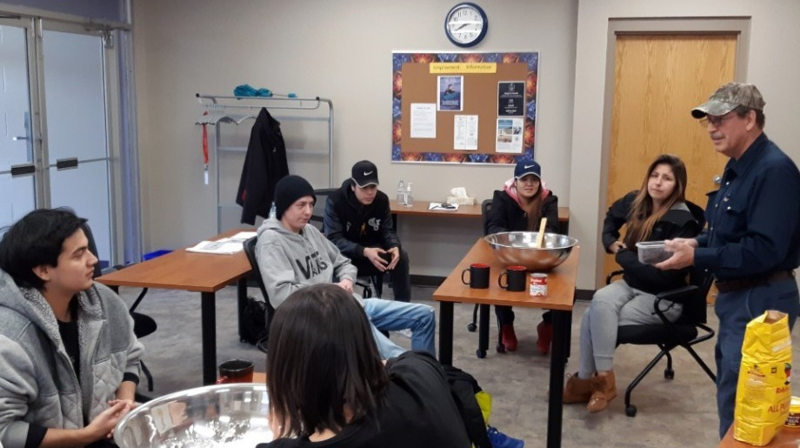 The program can be accessed from Kiashke Zaaging Anishinaabek, Fort William First Nation, Animbiigoo Zaagi'igan Anishinaabek (Beardmore), Biinjitiwaabik Zaaging Anishinaabek, Pic Mobert First Nation, and Thunder Bay. Our goal is to allow citizens of our member First Nations to achieve their goals without having to relocate. Participants in the Mino-niigaanendmowin program complete 12 weeks of education, 2 weeks of life skills, and a 15-week work placement. The education portion of the program is provided by Seven Generations Educational Institute, building on an existing partnership between Seven Generations and Fort William First Nation. This has allowed us to have full-time high school teachers working at the sites, allowing participants to work towards real high school diplomas. Anyone can enroll with these teachers, even if they do not qualify for the full Mino-niigaanendmowin program. This program would not be possible without the support of the communities. Each site operates out of donated space, and some communities have even provided living quarters for the teacher free of charge. Classes have drawn on community resources to provide cultural experiences for the participants. We wish to acknowledge Kiashke Zaaging Anishinaabek; the pilot program that ran in that community a few years ago continues to be the template for what we are doing now. We are now accepting participants at all program sites. If you are interested in the program, contact the site facilitator for your area.